IBM is building slimmer versions of its Power hardware -- used by its Watson supercomputer -- to run complex database applications as well as simpler Web-based ones. IBM has designed its latest Power servers for social networking, search engines and cloud storage, as computing moves from PCs to mobile devices. Beyond the cloud, the new servers with Power8 chips also have the horsepower to handle more complex applications like databases and analytics. The multipurpose servers include the four-socket Power E850, which can handle private, public and hybrid clouds, and in-memory database applications. The more powerful Power E880 is for large-scale database and cloud implementations. Companies like Facebook, Google and Amazon are building mega data centers with inexpensive cloud servers based on x86 chips from Intel. But those servers typically get busy during peak hours when cloud services are in demand, and IBM wants to provide more flexibility in its Power servers so they remain busy even during non-peak hours. IBM is guaranteeing 70 percent utilization of the Power E850 server. Power servers are still used in verticals like financial services, where high-performance and high-uptime servers are in demand. Through the new servers, IBM is hoping to attract companies looking to mix cloud and high-end applications in server installations. IBM sold its System X business with x86 servers to Lenovo in September last year and is now dealing only in Power chips and servers. But the demand for Power hardware and components has fallen with the growing demand for x86 servers. To take on x86, IBM has formed the OpenPower Foundation, an alliance to push Power-based chip designs into servers. Some notable OpenPower partners include Nvidia, Tyan, Google and Samsung. The Power E850 can host up to four Power8 chips, and has a memory capacity of up to 2TB, which is an improvement from the older Power E750. It has 11 PCI-Express 3.0 slots, two 10-Gigabit Ethernet slots, eight 2.5-inch storage bays and four 1.8-inch solid-state drive bays. The Power E880 can host 192 Power8 cores -- the number of chips was not provided -- with clock speed of up to 4GHz. The system supports up to 16TB of memory. IBM declined to provide starting prices for the servers. 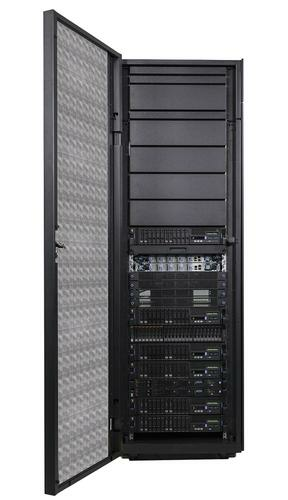 IBM also announced a self-contained PurePower server system and the XIV Gen 3 storage system. IBM also announced middleware and storage systems designed for easy management and provisioning of cloud storage.